A blog dedicated to demystifying the home baking process, as written by a slightly over-educated baking dork. I'm a writer who, at the end of a long day in front of my computer, loves to create something tangible and delicious in my kitchen. Baking is nothing to be afraid of! Unless you’ve been frozen in permafrost for the past five years, you’ve likely noticed that cupcake bakeries have popped up all over like iced mushrooms. Knock one down, and three take its place. Much has been made about not only the cupcake’s popularity, but also its incipient demise as the sweet du jour. Since we seem to be a culture intent on the next sensation, pundits, food enthusiasts and bloggers have all wondered what this sensation might be. More than a few have suggested that French-style macaroons (called macarons in France) might supplant the cupcake. This may or may not come to pass, but the basic premise of the French macaroon is pretty damned tasty. 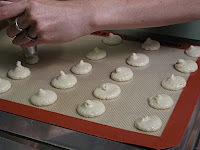 French macaroons are notorious for being difficult to master. Type in “macaroon,” “French macaroon” or “macaron” in your search engine of choice, and you will be inundated not only with bakeries offering these tasty little cookies, but scores and even hundreds of blogs all attempting to find the perfect recipe, the perfect technique. Which one is right? Which captures the perfect essence of macaroons? The answer is all of them and none of them. Macaroons are highly subjective, the subject of passionate, almost Talmudic study and debate. Chewy? Crisp? Age your egg whites? Ground the nuts or use nut meal or nut flour? Cooked sugar syrup, or confectioners’ sugar? In the words of a therapist, what do you think is the ideal macaroon? The answer lies within you. Will French macaroon supplant the cupcake as the next sweet trend? There’s no way to know. I couldn’t have predicted the resurgence of leggings, yet here they are. I’ve tried many, many recipes, and have discovered that my favorite macaroon recipe comes from Claudia Fleming’s The Last Course: The Desserts of Gramercy Tavern. They have given me the most consistent results and so, for everyone’s delectation, I present to you an adaptation of Ms. Fleming’s recipe. Theoretically, this yields 10 dozen macarons. My own attempts yielded 2 dozen filled, sandwiched cookies. P.S. When I'm not baking, I'm writing romance under the name Zoe Archer. Please pre-order my book, Half Past Dead, and keep me in almond flour. Thank you for hosting this month's challenge and you chose a wonderful and very very challenging one. I think you really made people think about the recipe and the fillings they wanted. Great work on this challenge also love the pictures. Cheers from Audax in Australia. Thanks for hosting this month! I have always wanted to make macaroons and this finally forced my hand. I've only had one attempt and granted, it wasn't that much of a success (shells too fragile, ganache recipe I chose too runny) but it was all still delicious! Thanks for such a fun challenge this month! I love seeing the wide variety of colors and flavors! Thank you for hosting such a fabulous challenge. I had great fun and managed to make my first lot of good macarons! Thank you so much for this challenge! I really enjoyed it, and loved seeing everyone's adaptations =D. Great post too! Thank you for hosting this months challenge, and boy was it a challenge, but I enjoyed it very much so. Ami, I echo everyone else who's thanking you for hosting this month! I'm so glad I finally got to try making these, learned quite a lot, and had fun doing it. So, thanks! thanks for a great challenge--i bet a lot of DBers have been waiting for this one! Thank You for picking challenge we have all been waiting for. Thanks for the challenge Ami. I really enjoyed making them. I will definatly need to try this. I've attemped many times to make it but it never comes out just right. So I will give this recipe a try. 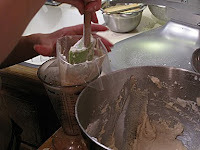 BTW, I buy my almond flour at http://nutsonline.com. Thanks for thinking of macarons! I thoroughly enjoyed making and eating them. Can't wait to see what's in store for next time. Thank you for this challenge! I didn't master it this time, but I'm hell bent on mastering it by the end ofthe week! NO matter what it takes! thanks for picking such a great (and challenging) challenge! your macarons look yummy! Thank you for a fabulous challenge! It was a GREAT time! Thanks Ami for the great excuse to indulge in a macaron making frenzy. Thanks for getting us on our toes this month & for the mac challenge. I ENJOYED it a lot. Your macs are delightful!! thanks for pushing the group into the feared macaron with both feet. Thanks for choosing such a great challenge recipe...lots of room for learning and for making them personal. Macarons are also something I would not have tried otherwise, so a double thank you! Thanks for hosting the challenge so well! Had fun making macarons! Thanks for hosting this months challenge! It was a lot of fun and really tasty too! Thanks for the great challenge this month! Your macarons are beautiful! Thanks for a wonderful challenge!! It was so satisfying to conquer the macaron! Thanks for picking this challenge! And a challenge it was... Not so successful as I had hoped but I will get there in the end! Thanks for the great choice. I love macarons!! Thanks for picking the challenge this month. I by the looks of all the blog, think everyone had some fun with it. I know I did. Those macarons looks so good. I want some of yours. Ami - Thanks for hosting this challenge! I'm still perfecting my technique, but really that is the fun part...Your macarons turned out lovely. Ami, thank you so much for this wonderful challenge. It got me to 'face' macarons again. Even though Claudia's recipe didn't work well for me, I was able to try others and finally master the darn things! 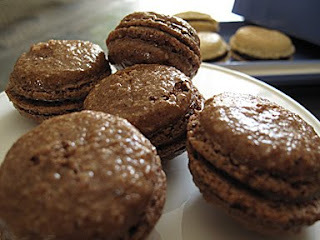 Well, never master, but get even feet and smooh shells..lol Love your macarons..they look beautiful and delicious! Thank you Ami for this challenge. With your challenge and many tips and hints I was able to conquer the elusive macarons. you said it difficult to master! It took me about 2 months to bake them (not everydays hopefully), the perfect one according me (italian meringue...blablabla). But you just get addicted as soon as the perfect shell somes out of your hoven. You cannot stop so proud you are of yourself (or maybe it is just my case...)! Then you browse for the ganache that will twist you! 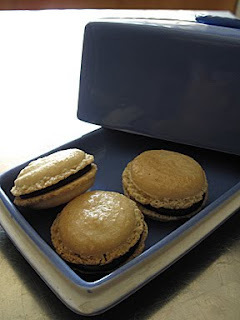 I was recently given a box of macarons from (allegedly) the best macaron maker in Paris, or in France for that matter, and wondered how to make them. And now I know. I'll be writing a post myself on the subject (www.acookonthefunnyside.com) and will link to you. Thanks for the informative article. Thank you for the recipe. This is a different method from my usual 280F all the way through...My first batch is in the oven right now. May I have the ingredients in ounce or grams, please?